To help alleviate concerns around privacy with ed tech tools, our partner, The Lamp, outlines three crucial steps for students and educators to follow that minimizes the risks. The growth of education technology (or “ed tech”) tools has led to loads of new learning opportunities for students and educators – as well as for advertisers and marketers eager to target young minds. Researchers from the University of Colorado found that educational apps used in schools in the United States and worldwide are collecting millions of digital data points on a daily basis, mostly from middle and high school students. While they’re conducting research, completing online assignments or collaborating on virtual projects, data are being collected which can be used to sell food, clothes, games and more. And, as researchers Faith Boninger and Alex Molnar outline here, many of the existing privacy laws designed to protect young people fall short. So what’s a mindful adult to do? Banning the use of educational technology tools at home or in school not only denies young people access to valuable learning opportunities, it also fails to take advantage of the chance to strengthen digital and media literacy skills. Here are some steps you can take right now to strike a balance between letting young people use ed tech, and letting ed tech use them. 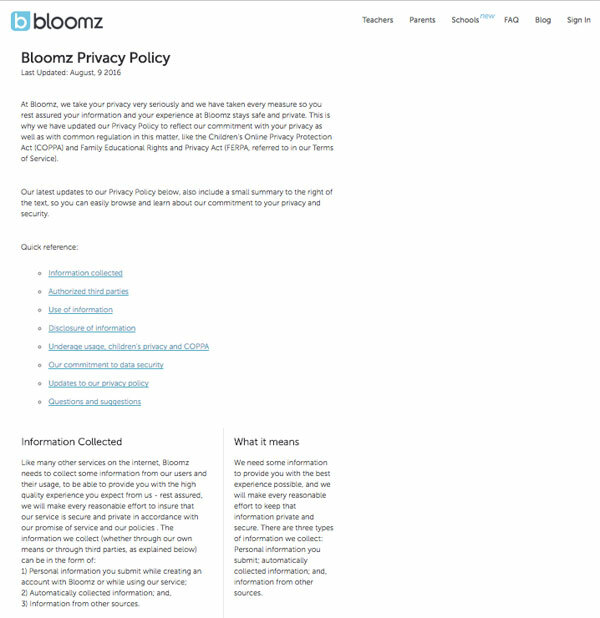 As you go through the sections of the Bloomz policy, you’ll read that they do share user information with third-party vendors to serve up ads. (They say the data is anonymous, but as Boninger and Molnar advise in their piece, beware of this promise.) The decision to proceed or not with a company that shares user info is yours, but you need to know either way. The old saying is true: Nothing in life is free. Even though you don’t pay a Facebook bill, they get plenty of data and information from you in exchange for using their platform. Ed tech is no different. Especially if a tool is free, they’re probably gathering your data and then selling it. 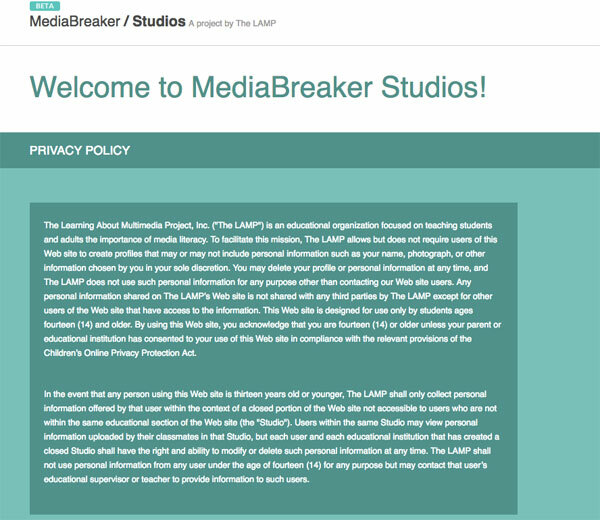 In the case of MediaBreaker/Studios, the tool is free and we don’t sell data, but we at The LAMP do cite MediaBreaker/Studios in our fundraising efforts and hope that people will decide to support us financially. Most edtech companies are funded by private investors or venture capitalist firms who own a stake in the company and expect a return on their investment; you should be able to find the names of the firms and individuals on the company’s “About” or “Our Team” page. When the folks behind a tool are a nonprofit, like The LAMP, Gooru, or a learning institution like Harvard’s Berkman Klein Center and their Digital Literacy Resource Platform or Parsons’ TripleC, the tool may be paid for by grant funding or donors. In this case, no one expects to receive money back, and shareholder profit is not the endgame. The ugly truth is that whether or not some ed tech company is tracking you or your students, some other company probably is. And whatever lessons you’re teaching with education technology tools are not as rich as they can be if you’re not also teaching about how and why media messages and technology are produced in the first place. The LAMP has free tools like MediaBreaker/Studios and LAMPlit to help you do this, and we also have hands-on programs here in New York City in addition to curriculum licensing and development available nationwide. You can also check out the resource hub at the National Association for Media Literacy Education (NAMLE). There you can find resources from organizations and educators on a wealth of topics for all grade levels.